There is a thing, called The Soar Tour, in the making. 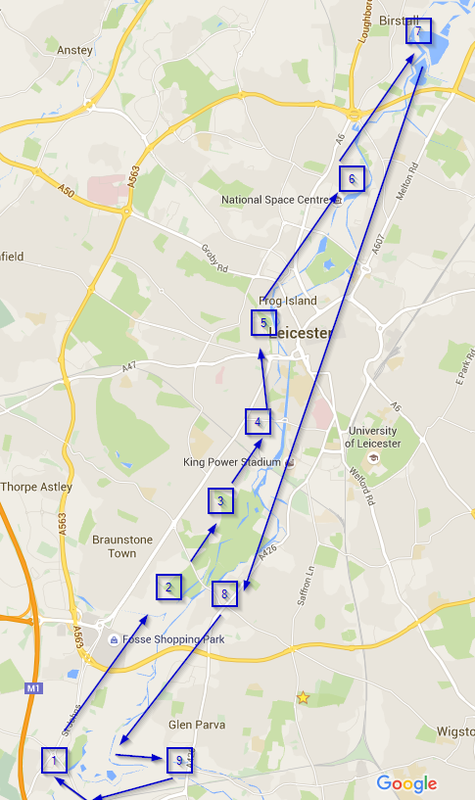 Peeps who have joined us for Barrow trips, or whom have just paddled on the Leicestershire waters will no doubt have come across posts decrying the Sour Tour and doing a spot of searching I came across this site, (also in the making). I'd popped out for a local bimble at the weekend and with the recent rains figured the R.Biam backwater/loop would be fun. Photos below. Anyway, whilst pootling about I kinda thought about a ... dum-de-dum .... plan ... to whiz the Huron round 'lots' of the Sour Tour on a single day. Starting on the R.Soar at 8:15-8:45 Jubilee Park, Enderby (52.5893245,-1.1720423) - Not far from M1 J:21. Pick up the R. Biam until it joins up with GUC. Stay on the GUC for a short stretch until the R.Soar splits off  to the left - and follow that until it feeds back onto the GUC. At Glen Parva, its a short portage to the R.Sence, and from there, back to Jubilee Park. So maybe something like 24 - 26 Mile total, but plenty of options to drop a loop or two. So with stops maybe 10-12hrs. Not really expecting this to be an easy paddle - the Biam can, and the Sence will, be blocked, and with some scramble/porting/mud and some small ingress/egress to/from the water. Lot of paddling if all the possible loops/sections are done. That said I'm not expecting this to be difficult/dangerous either - (I've happily done all of the sections solo and/or tandem with Jewels666). Anyway some photos from yesterday's little jolly, just by way of scene setting. 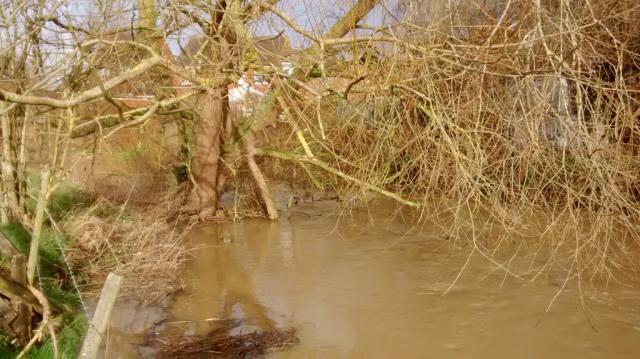 This is the R.Soar, through Aylestone Meadows, with lots of water.... .. and so is this. 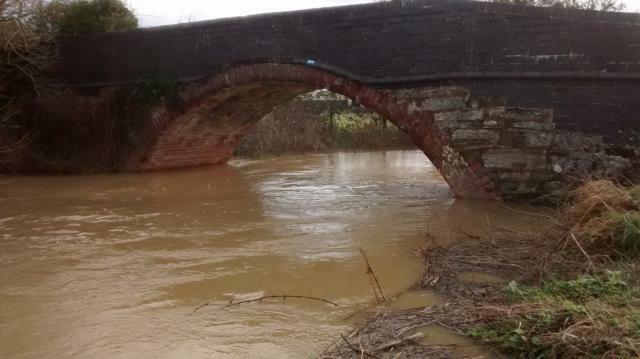 Deffo more water than usual, this old railsway bridge is followed by a shallow gravel rash - so wet feet here is likely. Possible 4x more water than in spring/summer, where this can be borderline ditching. Quite a lot of evidence of maintenance/bank clearing, which does make some of the backwater paddling feel more open. As well as quite a lot of inner city redevelopment. Would be great to make more a feature of the rivers/canals!. Passed this recumbent yak - old fibreglass, with small hole in the bow. Looked generally serviceable - so not sure if lost/stolen/abandoned. So any takers ? - preferred dates ? Sort of thinking of numbers between 1 and 6(ish). As its the first time I'll have tried this, I've suggested limiting to 6(ish) - which may well be 5 more than express interest anyway :-) - mostly around concerns on getting boats on/off water, possible obstacles etc. Sounds like good training. Were available most weekends. Apologies for the missing ' earlier! Sounds like fun - would like to come if the date is free (going to the Broads for the Easter w/e). A combination of canals and ditching? I'm going to be washing my hair, whenever this is. Wow, thx that's quite a bit of early tentative interest, for something that might turn into a bit of a slog. So date wise we're deffo looking at sometime after 19 March - end of the Six Nations England-France. would like to come if the date is free (going to the Broads for the Easter w/e). Easter is 26th/27th March , so discounting that weekend. Sun 27th Mar also marks the start of British Summer Time, so also makes sense to give ourselves the extra hour of evening light. So, based on initial comments I suggest we look at the weekend of Sat Apr 2 or Sun Apr 3, with an option of delaying a week to Apr 9/Apr 10 if the weather looks to be overly (unsafely) naff. Anyone got strong preference/limitation around either Sat or Sun? Castle Jester: No worries I can't even get the R.Soar's name spelt right!. I am the one developing the web site and working with the CRT to add canoe friendly port ages etc. Odrew: Nice work on the website , great if you can join us and cool to have this trip contribute, albeit in a minor way, to your ongoing work with the Soar Tour and CRT. There are deffo some bits we'll hit that highlight where access could be improved!. Based on your experience, do the distances/times on my first post seem about right? Peter: Will be a similar mix of 'fun' as the Watermead Loop + Wreake jolly you joined us for, but more of it! Per: I'd suggest full body decontamination, but would not want to put anyone off . For those concerned about their hair , there are a number of (optional) weirs, with varying likelihoods of adding a bit of a swim to the day - as well as the possibility of some thorn bush combing. Looking for quite an early start, so happy to provide a bit of floor/tentage space night before if that'd help - I'll also see what other local overnighting opportunities there are. Subject to a dryish weekend day, I'll do a run down the Sence beforehand with a saw and see if I can clear some of the river. It's the most ditchy, troublesome stretch, and we get to it when most tired. Early days yet and fully appreciate tentative interests change, but start pencilling those diaries. I'm interested, will keep an eye on the dates and confirm nearer the time. April 2/3 in my diary, either would suit me so you could choose the forecasted better weather! I reckon that last trip we did was only 10 miles and took 4 3/4 hours, so your 25 mile plan is quite a marathon! I'm not sure what your 'Huron' boat is; is it your wooden open canoe or are you trying to sneak in a k***k? If so, I might bring an old WWR boat that would make life easier! I reckon that last trip we did was only 10 miles and took 4 3/4 hours, so your 25 mile plan is quite a marathon! Depending how the day goes, there could be an attempt at the middle section of the Soar Tour later in the year (i.e. Birstall, Watermead Loop up to and including the two small loops south of Barrow) and then a pondering of the insanity of the final Loughborough loop up to the Trent (although that might well need to be split in two - not least as a lot of it is up and down the same stretch of 'yawn' canal :-(. Kinda done all this before, but in 15+ trips rather than 3 or 4!. This initial proposed day is probably the most varied/interesting/fun so will see how that goes before contemplating further tho! Yup . Bit nippier, lighter and somewhat more sprightly than the Pelican! Does mean wetter feet minimising canoe gravel rash in shallows, but much easier on the shoulder!. Nice Update: Jewels has kindly offered her support bank side. So we'll have some cover for boat(s)/peep(s) in case of emergency and/or waving enthusiastic encouragement. Into feb now, so less than 2 months bump. Warnings: May contain spoilers, nothing useful, gut frames and a bloke going "erm" a lot. Very entertaining Jon, and the whole trip only took about 10 minutes! Tension is really building now on this one! Had a pop up to Glen Parva at the weekend with a couple of saws, had a look at the height and flow of the water, wimped out, and went for a tootle up the canal instead. The water was a good 2 foot higher than 'normal', far to easy to get pinned and ultimately anything cut now is likely to be 2 feet above the waterline in April. Easy launch (had I gone for it) - usually launch from the right of this piccy is down a couple of feet slippy drop! 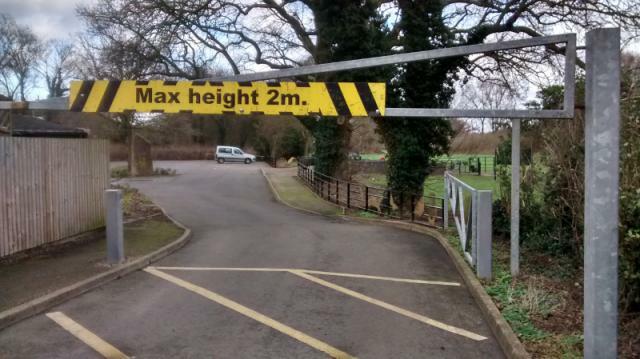 For info Jubilee Park car park has a height restriction of 2meters. Certainly I need to unload boat off landy before going through, but though I should mention as I'm not sure on standard van height. There is nearby street parking if necessary. The car park is open 6-9 (+/1 30 mins) in April, so we're looking at away before 9am, back 8pm(ish) latest, so if ~25miles (max) is accurate we'd be running at an average of just over 2mph. That said we can easily shorten the trip if time/enthusiasm become challenging :-). There is a Toby Cavery <50m away, so suggest drink/grub thereafter may fit? Currently targeting Sat Apr 2nd. However if peeps availability/weather closer to the time make Sun 3rd a better option, then we can easily shift. May need to downsize, transport and boat wise, worst case scenario being(for the purists), small blue SOT, car should be inoffensive enough. Jewels, what are your plans for the day(if not paddling),and would you like company, as Sooz will be providing transport for me( depending on me not being barred for the SOT)? Sooz is welcome to join me, planning to catch up with the flotilla at various points along the way. To encourage and give abuse where needed. Just under a month to go to the "Currently targeting Sat Apr 2nd." so thought I'd bump this thread a bit. As well as offer of floor/garden space, if anyone is coming from far afield, then there may be an option where Jewels can make the local Scout hut available for Fri (after 10pm) or Sat night accommodation. I.e. lob tents/mats up inside hall. There is a pub within 50meters or so too. If the van won't fit under, you can unload, by Jubilee Park and leave the van street side - or I've a touring yak (Dagger blackwater 10.5) or the spinny-er Mamba 8.5 if you fancy either of those for the day? Garden space or any other space will be gratefully needed I just hope weather stays on our side for this one. I'm getting sick of cancelling paddles this year and its only March! I've a touring yak (Dagger blackwater 10.5) or the spinny-er Mamba 8.5 if you fancy either of those for the day? You can paddle with me if you can put up with my incessant talking and poor steering. Space deffo available. Agree on the weather front, been out for a couple of local paddles as weather been too naff/unpredictable to plan for weekends further afield. Local water very high at the moment, but still have a few weeks to improve. Looking forward to this as being the start of summer :-). With the recent rains and high water, I figured a little pootle to check the loop from Jubilee Park to GUC and the R.Sense would be a fun way to enjoy some Sunday Sun. However stting of at 10:00am got me as far as the GUC, with only a hint of the promised sunshine, so decided to carry on down the Biam, and then as the sun did come out, carried on north around Abbey Park/Space Center (pt 6 on the mpa) and then back. So what I'd anticipated as a 2 hour excursion turned into the better part of 7.5 hours (incl bacon and egg fry-up stop). I kinda started this thread with this trip being more of a challenge than a bimble, and having done a fair percentage of the proposed water, I think the original premise is still correct. It is a bit of a challenge!. Have a few scapes and scratches from cutting back thorny bushes, branches, and slurped though a lot of mud. The recent rain made the R.Sense very interesting. Deffo need for some deft paddling to avoid strainers/clumps of backed-up wood. The rains have also left a lot of rubbish. The "One Mile Straight" is, lets face it, one mile and straight = yawn! and my enthusiasm for locks was waning slightly before the first one!. All that said - it was great to be out on the water under the sun. With a bit of excellent company and (hopefully) fair weather, then it should be a good day - just expect mud, sore arms and ignore the rubbish. (So what I'd anticipated as a 2 hour excursion turned into the better part of 7.5 hours (incl bacon and egg fry-up stop). a) it took 7.5hr to do what you expected to do in 2hrs? 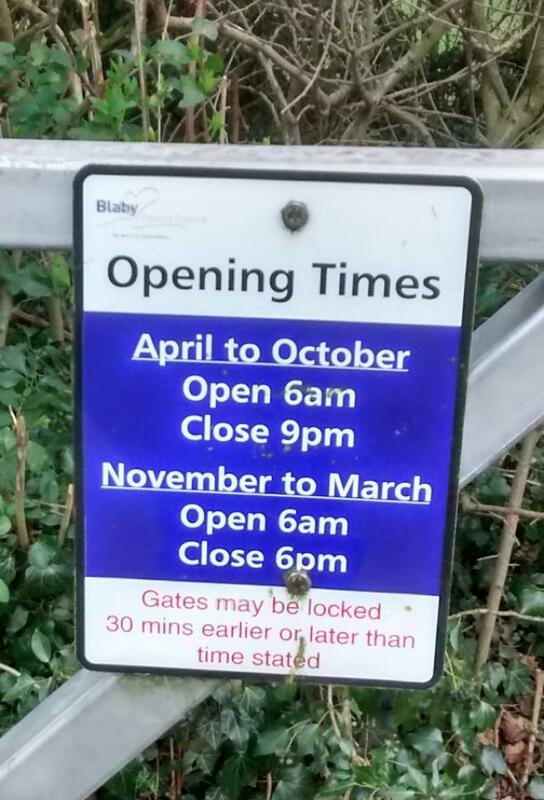 b) you stayed out and did the lot in 7.5 hrs? c) too much bacon and egg? (You can paddle with me if you can put up with my incessant talking and poor steering). Original idea was to do the 'Sense loop' (on the map: 1->2->8->9) 'cos those river sections are the most likely to be blocked or obstructed. Did saw back the local shrubbery in a few places to generally make passage easier. Was 'safe' enough already, but the Sense is single lane, and we'll need to be reasonably well spaced. However as the Sun was only just appearing when I got to pt 2 I decided to keep going. I didn't do the whole trip, wanted to leave that fun to when you chaps pop along, so missed out the section from 6->7 (and back again) - which is roughly 4.5 miles. It wasn't a 'timed run', and it was helped by a lot of river flow. The actual day deffo isn't a race, but does give a fair indication we can do the distance before the car park gets locked at 8:30-9:30pm. Feel gutted but I'm going to have to miss this now . 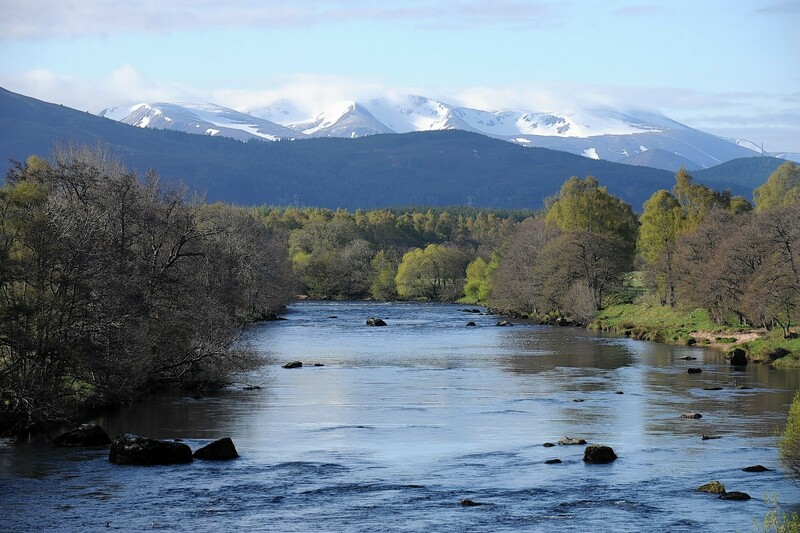 No worries & thx for letting me know: cash & weather have generally kept my paddling local so far this year too, and I can certainly see the appeal of Scotland over Lesta! :-). Just done a quick, and early doors check on the long range forecast, and the Sat is looking to be the better day, so unless there is a major reversal (or it gets totally naff all that weekend), then Sat 2nd looks to be confirmed as the day we should aim for. Looks to be mostly dry after the preceding Tuesday so water levels should be 'normal' (ish). - not unless you're going the whole way. Yup still thinking in the 10-12 hr range, notionally closer to the 10, but a lot depends on the day (and how accurate the guesstimated mileage is). You're more than welcome to join the party, so I've added your name to the potentials list. 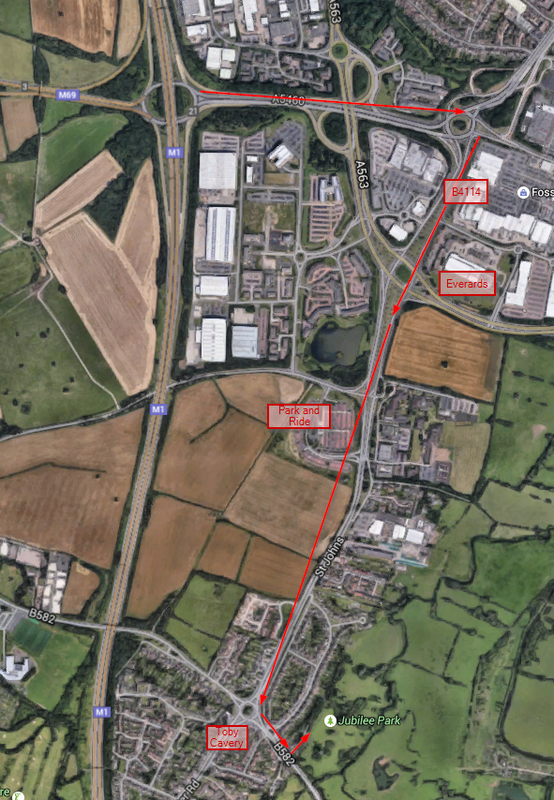 I know peeps generally have GPS etc, but just in case here's a mini map from M1, Junction 21. Still looking at around 8:15-8:45 to meet&greet/get ready etc. No shuttling of vehicles, so good to be on the water and away for 9 (ish). Might be handy if, over the next few days, potentials can confirm attendance or alternatively advise of a sudden need to be hair-drying at the weekend. Mostly just so we know whether we are waiting for someone before we launch. Been a long paddle-free weekend of catching up with family, so looking forward to next weekend!. I'm still planning to be there. Do you want me to bring some supplies - bacon, cooking stuff etc - although this might need to be carried by the 'support team' to minimise weight! I'm still planning to be there. Let me know if I need to bring any stuff to share. Hi folks, "supplies" and "stuff" should not be needed, but thanks for askin', as current plan has these catered for and lobbed in the back of the support vehicle/team :-). However I'll yell if said plan changes . I'd generally recommend 'travelling light', just cos there is a fair amount of boat shuffling betwixt river & canal and around locks. Thanks Jon - would you recommend a trolley? From what I've seen in the river, Asda do some very nice ones, although they don't seem to float too well. Gratuitous facetiousness aside, I tend not to take wheels. There are a few places (lock opposite the Walkers stadium) where they would be handy, however for the transit of canoes between river and canal, and over Jubilee Park, then wheels won't work (i.e. manual handling, somewhat reminiscent of the Wreake, is the order of the day). Like to think that between a few of us we can carry? Looks wonderful John, can deffo see the appeal over Lesta. Abs no objection, but touring 'yak still available if that's of interest. That the picture from your shampoo bottle?? touring 'yak still available if that's of interest. There is lane-side space off the main road, just outside the car park for tall van, but I like having different craft types on paddles too :-). Are any of you peeps vegetarians or have any specific requests for healthy lunch option - otherwise it'll be a heart stopping fry-up all round. Water levels are looking highish, but safe & should drop a bit over the next couple of days if weather stays true to forecast. Sat still looking dry and hitting the heady heights of 12degC. No worries Gary, thx for letting me know & looking forward to seeing photos of the new canoe!. I tried to send this as a PM but your store is full! Store is now suboptimally laden - thx. Will send PMs with mobi to confirmed peeps later on today/tomoz. The following map is a rough attempt (for the benefit of the support team) of guestimating progress. It'll also give us some idea of how we are doings vs. car park being locked @9.00ish, and whether we need to cut short at all. 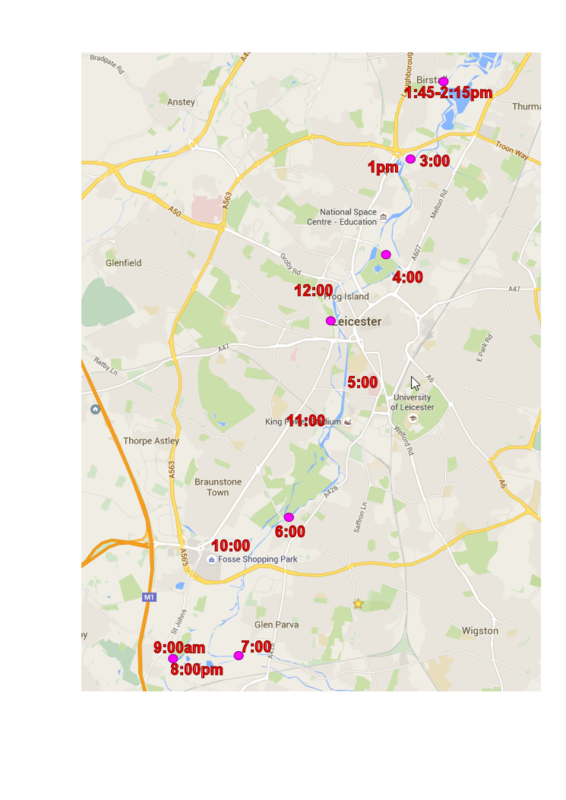 I'll hopefully update with real timings after the event - may be useful info for others doing the same route laters. Pink spots indicate most likely rendezvous spots i.e. where there should be some free car parking. Popped by Jubilee Park, water slightly high, and flowing well, on the safe side of interesting. Lunch for all is in the fridge. Safe drive to all and see you in the morning.